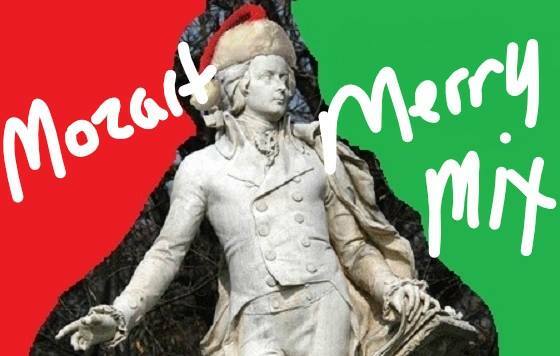 'Tis the Season for a Mozart MerryMix! Taking the idea from a past article, I thought I'd create a Christmas playlist that included a few of my favorites from YouTube. Mozart's music, like all great music, adds a fulfilling dimension not only to the holidays, but to all seasons. So, in the spirit of the man and his music, I thought a curated Mozart MerryMix was in order. Tinged with both reverence and merriment, it features the sacred and secular, vocal and instrumental. On Christmas Eve in 1788, Mozart entered 12 minuets into his catalog (KV. 568). The following is the translated entry written in his own hand: the 24th ditto. 12 minuets. for 2 violins, 2 flutes, 2 oboes, 2 clarinets, 2 bassoons, 2 trumpets, timpani, flautino and bass. Listen and enjoy with festive ears! It's easy to imagine a grand ballroom with dancing couples, a small orchestra, candlelight and the glistening snow falling outside. Written in 1773, Mozart's Exsultate, jubilate (Exalt, rejoice) (KV. 165) is often a staple of Christmas music programming. Mozart was a teenager when he composed this work for the Italian castrato Venanzio Rauzzini, whose technical agility he admired. While mostly performed by female sopranos today, it still receives worthy vocal treatment by boy sopranos, countertenors and male sopranos. Listen to American male soprano Michael Maniaci sing the Allegro from this piece. Watch German soprano Diana Damrau, an incredibly gifted artist I've seen perform in person in both New York and Vienna, sing the Alleluja on a German TV show during Christmastime. A product of his tenure in Salzburg dating from 1780, Mozart's Vesperae solennes de Confessore (Solemn Vespers for the Feast of a Confessor) (KV. 339) is another perennial favorite. Watch Anja Harteros perform the Laudate Dominum (Praise the Lord) for the annual advent concert at Dresden's Frauenkirche (Lutheran Church) with the Chorus of the State Opera Dresden and Maestro Christoph Eschenbach. Mozart completed his Flute Quartet in D (KV. 285) on Christmas Day in 1777. The work was part of a commission by the amateur Dutch flautist Ferdinand De Jean. In a letter to his father, Mozart said of the flute: "You know that I become quite powerless whenever I am obliged to write for an instrument which I cannot bear." If he disliked the flute, there's no sign of disdain in his writing for it. Watch the quartet Ensemble ACJW bring Mozart's Christmas Day flourish to life at Carnegie Hall! Handel's Messiah needs no introduction. However, Mozart's more obscure arrangement of this work (Der Messias, KV. 572) certainly does! In 1789, Baron Gottfried van Swieten commissioned Mozart to re-orchestrate the 1742 oratorio to accommodate contemporary musical taste and style in German translation. The result is a glorious marriage between the two masters, fusing Baroque counterpoint and Classical style. While I've attended a performance of Handel's original at St. Paul's Cathedral in London, performances of Mozart's arrangement are unfortunately rare. Watch the performance of Uns ist zum Heil ein Kind geboren (For unto us a child is born) by the Bach-Collegium Stuttgart, soloists and Maestro Helmuth Rilling. Mozart's Ave Verum Corpus (Hail, true body) (KV. 618) tugs at the heart strings for its composition and context, making it all the more appropriate for the Christmas season. Mozart gave the motet as a gift to Anton Stoll, organist and choirmaster at the church in Baden, for looking after his wife Constanze who would often visit the local spa to remedy her ill health. It wasn't a commissioned work as most were for Mozart, but an independent expression of gratitude. It was written in June 1791, just six months before his death. In a world consumed by materialism, let Mozart's gesture remind us that this is the season of giving and gratitude. Watch the James Last Orchestra and Choir of St. Michael's Church in Hamburg interpret the work for their annual Christmas concert. In closing, a bit of trivia! Did you know that Stille Nacht (Silent Night) was performed for the first time on Christmas Eve in 1818 near Mozart's hometown of Salzburg? The lyrics were written by the Salzburg pastor Joseph Mohr and the melody by Franz Xaver Gruber. I thought it would be nice to end the playlist with a selection capturing the contemporary sights and sounds of Christmas in the town where Mozart was born and lived most of his life. In his father Leopold's words, Mozart was the "miracle which God let be born in Salzburg," Watch! Merry Christmas, Mozartians! Froehliche Weihnachten!